I experienced movie fright early in my childhood. At the ripe age of seven I was taken to a drive-in to see Alfred Hitchcock's The Birds (1963), and I spent a good portion of those two hours cowering beneath the dashboard of the car. Despite all that cowering, I was thrilled. To this day I love that film and wonder how that initial childhood experience figures into the attraction. Years later, I saw how movie terror can affect an audience at a screening of Ridley Scott's Alien (1979). The show was nearly sold out. My companion and I arrived late, and our only option was to sit in the front row; behind us an audience was about to scream and shriek in ways we had never heard before. The crowd was clearly enthralled with Alien from the beginning. The usual chewing and slurping sounds (courtesy of the concession stand) were soon drowned out by anxious murmurs and nervous laughter. I remember well the moment when the film transformed our experience from merely somewhat frightening to flat-out terrifying: it was when the carnivorous alien baby unexpectedly and gruesomely bursts from the crewman's stomach, its high-pitched scream doubling the terror and sending much of the audience into an extended fit of shrieking from shock, fear, and revulsion. From that moment on, we all understood that for the length of the film we could never rest easy, for we might get the hell scared out of us again at any moment. Some may dismiss these moments, however powerful, as of negligible interest or as the kind of idiosyncratic, subjective information that belongs in someone's diary, hardly important to the understanding of the workings and significance of movie spectatorship. In this book, I take a different position. The images and sounds of The Birds and Alien have been seared into the memories of generations of moviegoers, becoming cultural icons. And it is the ability of those films to strongly move audiences that make the films memorable to many viewers. Strong emotions have a tendency to make a mark, leaving lasting impressions that transform our psyches and imprint our memories. For that reason alone, the means by which the movies elicit emotion are worth taking seriously. But let us consider other sorts of affective experiences inspired by the movies, experiences that are more difficult to analyze than a fear response. A viewer watching a melodrama may simultaneously weep and feel ashamed of weeping. At the end of The Royal Tenenbaums (2001), when Royal finally learns how to care for his family, audience members may find themselves inexplicably teary-eyed. Titanic (1997) has become one of the highest-grossing films of all time, yet it recounts a horrifying tragedy with stark realism and features the agonizing death of one of its protagonists. Viewing some of the films of Alfred Hitchcock may elicit responses remarkably similar to guilt and shame. But how can a movie possibly cause an audience to experience the self-directed emotions of guilt or shame? After all, what does an audience, as a mass entity, have to be guilty for or ashamed of? Why would audiences put themselves through the experience of such negative emotions? Aristotle found the elicitation of emotion to be one of the key strategies of persuasive discourse. How are emotions at the movies used for rhetorical or persuasive ends? My early experiences with movies sparked my interest in these questions and initiated the research and thought that has culminated in this book. During my graduate studies, it seemed to me that many scholars either failed to grasp the importance of film-elicited emotion or (like me) had no idea how to research the issue. In all of the academic talk about film interpretations, meanings, negotiated readings, comprehension, and so on, what is often forgotten is that for the vast majority of film spectators, movie viewing is first and foremost a pleasurable experience, suffused with affect. Audiences are willing to pay for this experience with money, time, and effort, and in exchange they expect to be fascinated, shocked, titillated, made suspenseful and curious, invited to laugh and cry, and in the end, given pleasure. On this foundation of pleasurable affect rests the multibillion-dollar international media industries. Film and media scholars sometimes use the tired literary metaphor of "a reading" to describe the viewer's encounter with a film. Not only does this terminology deny the essential differences between viewing images and reading words, it implies that film viewing is a cool, intellectual experience. Perhaps for some audiences, and in relation to some films, the experience is cool and intellectual. A "reading" is what some academics do in the classroom, days after the screening. Audiences at the movies, however, are often thrilled, excited, or exhilarated; moved to tears, laughter, scorn, or disgust; made fearful, expectant, curious, or suspenseful; absorbed and focused; outraged, angered, placated, or satisfied; given elevated heartbeats, sweaty brows, and galvanic skin responses; made to scream, yell, and excoriate the bad guys; and usually, relieved and calmed at the film's end. Are all of these affective elements of film spectatorship mere epiphenomena, the throwaway detritus of what is worthwhile about the film viewing experience? Can these aspects of viewing movies be safely ignored in favor of what is often thought to be the heart of the matter—the abstract themes or symptomatic revelations in a film teased out in a "reading"? In the analysis of films and literature, traditional interpretation searches for hidden meaning, as though each work of fiction embodies abstract propositions in the form of messages or themes. It is the job of the critic and the viewer or reader to ferret out these messages, lift them from their context within the work, reorient them into some kind of brief philosophical treatise, and take the implication of that treatise as the purpose of the film, or at least as the locus of its true worth. But this way of thinking about film diminishes the art form by reducing it to a bare bones propositional message. It ignores the spectator's experience in viewing the film, places ultimate value on the propositional content that is later distilled from that viewing, and misunderstands the function of the viewing experience in developing the film's themes and ideas. Such a mistake is commonly called the "heresy of paraphrase." As film critic and scholar V. F. Perkins writes, "Too great a concentration on what a film 'has to say' implies that the significance of a movie is reducible to the verbal concepts which its action suggests." Instead, Perkins suggests, "the movie's claim to significance lies in its embodiment of tensions, complexities and ambiguities. It has a built-in tendency to favour the communication of vision and experience as against programme." I would put Perkins's suggestion slightly differently. Any abstract meaning that a film might have is ancillary to the experience in which that meaning is embodied, an experience that elicits emotions that are dependent on the formation of desires in the audience with respect to various narrative outcomes. Experience creates its own meaning, and in some cases the meaning to be taken from the experience of the film may contradict the abstract meaning an interpreter might glean from film dialogue, for example. Affective experience and meaning are neither parallel nor separable, but firmly intertwined. The viewer's affective experience in part determines meaning, and a lack of attention to, or an inability to understand, affective experience could well lead one to misunderstand and mischaracterize the thematic workings of a film, and perhaps even to misunderstand the story itself. Why have affect and emotion in film viewing received relatively little attention in film studies? The reasons for this neglect are several. A strong strain of Western thought has considered emotion to be antithetical to reason and an obstacle to logical and/or critical thinking. Recent developments in cognitive psychology and philosophy, however, have challenged this idea. It is now commonly believed that emotions may be either rational or irrational, but that to consider emotion to be prima facie irrational is simply confused. Bertolt Brecht, the influential Marxist theorist of the theater, seemingly embraced this distrust of emotional response as antithetical to critical thinking, and argued that the politically useful play should not arouse the emotions so much as estrange and alienate the spectator to keep him or her cognitively sharp and somewhat skeptical. The neo-Brechtian screen theory that dominated film studies at the end of the twentieth century evinced an implicit disdain for the "soft," bourgeois—or at any rate, somewhat embarrassing—emotions of the audience. Other reasons could be given for the neglect of the emotions. The reliance of screen theory on psychoanalysis moved attention away from emotions and toward drives and instincts. One suspects that an implicit (and simple-minded) sexism may also have been at work in film studies and in the broader culture, devaluing emotions as feminine; we see this in the special disdain some have for the "sentimental" emotions, while the ostensibly masculine anger and vengefulness, which would seem to be much more potentially harmful, rarely receive such contemptuous treatment. Indeed, when one hears the emotions denigrated, it is usually the sentimental or sympathetic emotions that bear the brunt of the criticism. Yet another reason the emotions have been neglected is that they have been thought to be subjective and private, and thus not the proper object for academic study. Perhaps people may write about their emotions in diaries, discuss them with their friends over a coffee or a whiskey, or better yet, visit a therapist. But why study emotion or the means by which films elicit emotion? Academic film studies has been focused almost entirely on ideological studies of film, such that the means by which films generate an audience experience colored with emotion and affect is unimportant, unless it can be clearly shown to relate to ideology. To my mind, such a view not only devalues the experience of movie viewing (as important only in relation to class, gender, race, etc.) and fails to see the centrality of emotion in the ideological work of movies, but also mischaracterizes emotional experience as necessarily subjective and idiosyncratic, as though emotions were not subject to causality. As the course of this book will make clear, I reject all of these perspectives. I argue that the expression and elicitation of emotion in film is a central element of the film experience, an experience that is worthy of study in its own right. Moreover, emotion and affect are fundamental to what makes films artistically successful, rhetorically powerful, and culturally influential. Hugo Munsterberg wrote in his fascinating 1916 book, The Photoplay: A Psychological Study, that to "picture emotions must be the central aim of the photoplay." Munsterberg is surely correct that a narrative film must centrally represent or "picture" the emotions. But my focus in this book with be not on how emotions are represented, but how they are elicited and how emotion and affect figure into the experience of the movie spectator. Any satisfactory account of film reception and its implications for ideology, rhetoric, ethics, or aesthetics had better be able to take film-elicited affect and emotion into account. • 1.The experience of emotion is one of the principle motivations for the viewing of movies. The sources of this pleasure and/or value viewers take from filmic emotions are both intrinsic (emotions that are enjoyable in themselves) and extrinsic (emotions that lead to pleasing meta-emotions, social communication, or some other use value). • 2.Emotions provide narrative information that is necessary for audiences to follow the narrative. In extra-filmic life, our emotions focus our attention on salient details of the environment; the emotions elicited in a film function similarly, often drawing our attention to those elements that the film constructs as essential to understanding the narrative. Emotions, moreover, assist the film's narration in the creation of sympathies and antipathies for characters. Emotions also provide a direction for audience desires for one narrative outcome over another. Storytellers both elicit and depend on narrative emotions such as anticipation, suspense, and curiosity. In sum, the spectator's emotions assist in the comprehension and interpretation of the narrative. • 3.Emotions and affects color the viewer's perception of a narrative, making it vibrant, enchanting, exciting, disgusting, suspenseful, fascinating, sad, happy, and so on. Emotions and affects may involve bodily responses, such as an accelerated heartbeat, tensing up and squirming in the seat, tears, laughter, or moaning. The viewing of a narrative film is not merely an intellectual or cognitive exercise, but one colored by affect and emotion. Emotions enable entertainment and enjoyment. The aesthetic excellence of a film, I would claim, is partly determined by its ability to elicit emotion and affect appropriate to its narrative focus and concerns. • 4.Emotions are intimately tied to our cognition, inferences, evaluations, and all of the other mental activities that accompany the viewing experience. Emotions and affects have implications for ideas. Since emotions and affects make ideas and images salient and memorable, they play a role in the creation of both cultural and individual memory. • 5.Emotions can also be used for rhetorical purposes. People routinely turn to their feelings for guidance when making judgments and decisions. It would not be too bold to say that the movies influence human feeling. In the short term, the function of emotion and affect is to make film viewing powerful, rather than merely an intellectual exercise. In the long term, such experiences may burn themselves into the memories of audiences and may become templates for thinking and behavior. This book offers a theory of affect elicitation in mainstream American narrative fiction films—what some call Hollywood movies. Hollywood offers movies as packaged experiences, commodities designed to engage audiences affectively and emotively, providing a pleasurable and/or thrilling experience. Although this book is in part a general theory of affect elicitation in film, I concentrate on Hollywood movies for four reasons. First, the film medium embodies works of such diversity that a theory of emotion-elicitation risks becoming unfocused were it to deal with the medium as a whole. In confining my study to what has been termed "classical Hollywood cinema" and to less mainstream films that draw from that tradition, I hope to be able to shed light on one particular sort of filmmaking and its mechanisms for eliciting affect. Needless to say, I would hope that the concepts developed here would also be of use in the study of affect in experimental, documentary, and other modes of narrative filmmaking throughout the world. Second, I concentrate on Hollywood film because it is a particularly emotional cinema. Mainstream American films rarely offer the kind of distanced, intellectual stance characteristic of some independent films (the work of Jim Jarmusch comes to mind) or various works of the European or international art cinema (such as the cinema of Michelangelo Antonioni, Andrei Tarkovsky, or Wong Kar-wai). Hollywood films tend to be either (1) robustly sympathetic, eliciting the congruent emotions that accompany strong sympathies with favored characters; (2) action films that ply in excitement, thrills, and spectacle; or (3) humorously ironic, making up for a distanced perspective with a tendency toward broad and ironic humor. In any case, mainstream films avoid audience boredom at all costs and attempt to elicit strong, clear (if also sometimes mixed) emotions throughout the viewing process. Third, Hollywood filmmaking is important because it extends its influence around the world. It intrigues me not so much for its aesthetic excellence (although I do think that some Hollywood films are artistically excellent) but for its rhetorical and ideological power. Fourth, since emotion is to some extent culturally constructed, confining this study to the American context reduces, but does not eliminate, the possibility of a kind of cultural myopia. As an American, my understanding of the assumptions of American filmmakers in constructing films for maximum emotional power, and of the cultural assumptions American audiences bring to films, is more accurate than it would be for filmmakers and audiences in Japan, India, or Brazil, for example. I would add that in confining my study to American film, I do not mean to imply that mainstream American filmmaking is superior to any other cinema. This being said, however, the theory of affect elicitation developed here has clear applications to much of popular narrative cinema. Thus, many of the processes of emotion elicitation described in the following pages can also illuminate the appeal of Chinese popular films such as Zhang Yimou's Hero (Ying xiong, 2002) and House of Flying Daggers (Shi mian mai fu, 2004), the Bollywood spectaculars produced in India, or European popular films such as Sergio Leone's spaghetti Westerns or various James Bond movies. To speculate about how individual films elicit emotion is clearly an interpretive activity firmly rooted in the arts and humanities—or at least, this is how I see it. Nonetheless, I draw on scientific and philosophical theories of human emotion and affect and attempt to locate the most persuasive current theories of emotion and affect from the broader academic and scientific arenas. In this book, I appeal primarily to research in film and media studies, psychology, and philosophy. I call my theory "cognitive-perceptual," in part to draw attention to its recognition not only of conscious cognitive processes in affective experience, but also to preconscious cognition and automatic, "cognitively impenetrable" processes. Affect arises from many sources, and a good theory of affect in the movies will be eclectic and open rather than rigidly myopic. Some film scholars reject cognitive approaches because they are thought to be rationalistic, seeming to assume a purely logical, conscious spectator. And it is sometimes thought that if we reject psychoanalysis, we no longer have a way to talk about the unconscious. A cognitive-perceptual theory, however, preserves room for unconscious and nonconscious spectator responses and for responses that, while not necessarily illogical or irrational, bypass the conscious inference-making that is mistakenly thought to underlie all cognitive film theory. Some will be surprised to see that I discuss psychoanalytic theories of affect quite extensively, especially in Chapter 1. It is true that psychoanalytic film theory, often called screen theory, does not occupy the central position in film and media studies that it once did. Yet it is still a force in film theory and criticism, holding an undeniable attraction for many film and media scholars. Screen theory introduced several concepts that many believe to be central to the study of cinema reception—concepts such as pleasure, desire, and fantasy. It makes sense to write of the "circulation of desire" in a film or to see a movie as, in some sense, a fantasy. Screen theory also found a way to account for the unconscious mental activities of the spectator. Unfortunately, screen theory failed to provide adequate models of how such mental phenomena operate. Serious criticisms of the theory have been leveled elsewhere and need not be repeated here. Many psychoanalytic interpretations of film not only tend to be counterintuitive to our experience of film texts but also test the limits of plausibility. To the outsider or the skeptic, the applications of psychoanalytic theories to film criticism can seem fantastical and absurd. Given this, Chapter 1, "Pleasures, Desires, Fantasies," argues that we can preserve the concepts "pleasure," "desire," and "fantasy" by displacing them from their technical moorings, as developed in screen theory. In part, my purpose is to advocate for a nontechnical use of these words, and to discuss and defend their use as common terms in folk psychology and in a cognitive-perceptual theory of film. My claim is that when these terms and the processes they describe are extricated from the conceptual thicket of screen theory, they can better be employed to reveal the richness and diversity of the film experience. Chapters 2, 3, and 4 further develop the cognitive-perceptual theory of film affect and emotion. Chapter 2, "Movies and Emotions," proposes a grounding theory of the kinds of emotions elicited by films. In this chapter, I characterize emotions as "concern-based construals," that is, as judgments or perceptions by an agent of how a situation affects her or his concerns. Emotions are vastly complex entities, but in this book I concentrate on their relational properties, on emotions as ways that agents perceive and construe the world around them. I also discuss similarities and differences between those emotions that occur inside and outside of the movie-viewing context. Chapter 3, "Stories and Sympathies," moves deeper into the elicitation of emotions in movies, drawing attention to the temporal and narrative character of emotion and demonstrating how the narrative scenarios of fiction films are designed to elicit a temporal sequence of particular emotional responses. The chapter also explores the structure of Hollywood storytelling and its conventional means of eliciting emotion. Character engagement is one of the most intriguing elements of the spectator's experience, figuring centrally in the viewer's emotional responses. The chapter also develops a theory of the spectator's interaction with film characters. If we take emotions as one sort of psychological entity among a broader class of affects, then a theory of affect-elicitation cannot ignore affective experience that extends beyond emotions proper. Chapter 4, "The Sensual Medium," demonstrates how the direct, visceral nature of the film medium contributes to the affective experience films offer. In this chapter, I discuss bodily engagement, or how the nature of sound and image and movement interact with the body of the spectator, making possible a sensual experience unique to the medium. The chapter also shows how representations of the human body in film initiate responses such as mimicry and emotional contagion. Along the way I discuss psychological phenomena such as auditory entrainment and mirror neurons, the discovery of which promises to contribute significantly to our understanding of spectator response. The study of the direct, sensory, and perceptual nature of film viewing is in its infancy. The function of this chapter is to highlight some of the approaches that might be taken, as well as some of the most interesting existing research in this area. Emotions (and other affective experiences) unfold in time; they are not like snapshots, but rather more like narratives. In Chapter 5, I argue that the spectator's emotional experience is largely directed by the film's narration, primarily in relation to narrative point of view, narrative structure, and character engagement. In this chapter, I argue against theories that in my opinion harness the spectator's responses too closely to the sympathetic protagonist. I argue that although the spectator's emotional response depends on and is related to the supposed emotional responses of a favored character, viewer response is most often independent of the protagonist to a significant degree and is most influenced by the narration at its highest levels. In this chapter, I also claim that the affective trajectory of a narrative film for a viewer can often be characterized as one of synesthetic affects, that is, as a host of orchestrated affects that together are designed to characterize a kind of emotional experience, not necessarily by eliciting the paradigmatic emotions associated with that experience, but by eliciting associated affects that characterize the feel or phenomenological qualities of having an emotion or emotions. To make this case, I analyze the evocation of synesthetic guilt and shame in some of Alfred Hitchcock's films. Chapter 6 explores what I call the paradox of negative emotions. Why do mainstream movies elicit emotions that are typically thought to be unpleasant? Do audiences enjoy seeing representations of the horrific or tragic events that elicit negative emotions, or is audience displeasure in these cases the price spectators are willing to pay for deferred gratification of another sort? Using the popular blockbuster Titanic as an example, I investigate the psychology of negative emotions in popular film, describing how the negative emotions elicited in Titanic are first psychically managed and attenuated, then transformed into positive and pleasurable emotions. I also examine the concept of catharsis, ultimately rejecting it as a form of purgation in favor of the "conversion" or "transformation" of negative into positive emotions. I end the chapter with an examination of the cultural significance of such sympathetic narratives of transformation. Whether one wishes to understand what V.F. Perkins calls "the naïve response of the film fan" or to gauge the broader implications of the elicitation of emotion, one sees that questions of emotion elicitation quickly shade into ethical, ideological, and broader cultural concerns. The most fruitful way to explore the cultural significance of affect in film, at least in relation to textual dynamics, is to examine the rhetorical uses of affect. My contention is that before such an investigation can occur, however, the critic must have a good understanding of the types of emotions and affects at work in the film or films. Chapter 7 offers some general principles about analyzing the rhetoric of emotion in films. It also demonstrates how such an analysis might be undertaken with respect to a particular emotion, in this case, the emotion of disgust. This chapter is meant as an illustration of one way to approach the rhetoric of emotion in film, an area of inquiry that is certainly in its infancy. Emotions are an enormously complex psychic phenomenon, and any theory of emotions is likely to pick out a segment of its causes, functions, and expressions at the expense of others. Marxists and sociologists emphasize the social determinants of emotion; physiologists and neurologists, the biological elements; many feminists emphasize gender and difference; those committed to psychoanalysis favor discussion of affect as filtered through particular theories of the unconscious. In this book, I explore the elicitation of emotion in mainstream American films. Similar analyses should be undertaken with regard to other traditions and types of filmmaking. Moreover, in this book I am interested in the evocation of what might be called "mass emotions." It would also be of interest to explore more personal and idiosyncratic responses to films. It should be clear that this book is not meant to be a comprehensive study of film and emotion in all of their aspects. My chief goal is to contribute to the ongoing discussion of the important topic of film and affect, and if some of the treatments of particular issues are seen as suggestive and provocative rather than complete, I will not be much bothered by that. Evan Cameron writes, in an essay on suspense in Hitchcock, that a "snag in writing about the way a film produces its effects is [that] finally one has to depend on a very subjective analysis of one's own feelings." It is true that gauging actual affective response of viewers is interpretive and somewhat speculative, especially when the critic begins asking the more interesting questions. But Cameron seems to assume that emotions are purely idiosyncratic and subjective, with no determining patterns. My argument in this book is that elicited emotions and affects are characterized and differentiated by structural features, such that the film's intended affective focus can be reasonably well determined in many cases. One can substantiate these analyses by noting personal response in addition to the reactions of other critics and audiences. It is also true that an understanding of the objective causality of affect, rooted in philosophical and psychological research, makes one more confident in making claims about a film's affective work. Thus, I have strong sympathies with an approach to film criticism that is rooted in an appraisal of the moment-to-moment sympathies and reactions of a hypothetical spectator. But I also hope to bolster such interpretation with an appeal to psychological theories and philosophical understandings of the nature of human affect in response to the movies. Before arguing for my theory, beginning in the next chapter, it is necessary to say a few words about the methodological assumptions and terminology at work in this book. Film and cultural critics became interested in spectator response early in cinema history, as soon as it became apparent that the medium had mass appeal. Yet film studies did not coalesce as a discipline until the 1970s. The screen theory that dominated the discipline in its early years—an amalgamation of Barthesian semiotics, Althusserian Marxism, and Lacanian psychoanalysis—took a rather deterministic view of the effects of classical Hollywood films, positing a uniform ideological and psychological effect not only for the films, but also for specific techniques such as classical continuity editing and narrative closure. As the theoretical pendulum swung away from the reductionism and determinism of screen theory toward audience studies, theoretical postulations of the effects of texts on spectators have reached the other extreme. Many film and television scholars seem to hold that meaning and effect derive not from film texts, but from the historical specificity of viewing contexts. Psychoanalysis is increasingly seen as reductive and little able to deal with historical specificity. It is seen as making response universal, rendering the appeal to spectator difference difficult. Psychoanalysis may offer an explanation of affective response, but it not only fails to account for the means by which different social groups respond differently, it lacks a theoretical mechanism to understand human difference, with the exception of gender differences. We might broadly consider these more recent approaches as historical or cultural reception studies. Their aim is the discovery of the ways that audiences have actually interpreted, been affected by, and/or used films within a sociohistorical context. Historical reception studies are often case studies of the reception of films that rely, as much as is possible, on historical evidence of actual spectator responses. As Janet Staiger puts it, reception studies try to understand an event (the viewing experience) while textual studies examine an object (the film). And the viewing event is understood in concrete, materialist terms. Staiger rejects notions of an ideal viewer, and does not attempt to understand how viewers might have responded, or how an ideal viewer would understand a film. Staiger is interested in actual spectators' responses. The reception scholar, then, denies that textual meaning adheres in the film, but holds that this meaning is more centrally a function of context. In addition, reception studies hope to move beyond the study of meaning to a broader conception of the historical effects or implications of a film on particular audiences, whether it be psychological, political, or otherwise. Historical reception studies have been a favorable development for the discipline and a necessary corrective to the reductionist and deterministic theory that they have in part replaced. It is certainly true that meaning and effect cannot be deduced merely from the examination of a film in isolation, but must take into account the historical audience and context. Moreover, historical reception studies have made some progress toward the writing of a history of film and television reception. That being said, however, the rhetoric of some reception theory, perhaps initially justified as it attempted to establish itself, underestimates the importance of the film text itself in influencing spectator response. The effects of a film and the responses it engenders are a complex matter; effects and meaning are not solely context-, text-, or audience-generated. Effects and meanings result from the interaction of all three. It is legitimate for scholars to concentrate on any one of these elements, so long as claims for what one has discovered remain circumspect and measured. Just as scholars may claim too much for the film, independent of context, so others may claim too much for the context, seemingly independent of the film itself. Estimations of the actual historical reactions and interpretations of audiences will always be somewhat speculative, unless one limits oneself to self-reports, the empirical observations possible through viewing audience behavior or measuring physiological response, or the measurements of heart rates and facial expressions. The most interesting actual audience responses are quite often lost to history, and for the reception historian, the best means to recover what they might have been—through movie reviews, for example—are often as questionable and/or partial as film-based estimations. Take the movie review. A movie review might be thought to be unproblematic evidence of the response of one member of a film audience, the reviewer. First note, however, that one critic's written review is a very small sample of general audience response. In addition, such a review is a heavily mediated, institutionally constrained report of the public response of a professional reviewer who may or may not share much in common with other viewers. The reviewer may report on general audience response, but such a report is limited to one or two screenings and to the subjective impressions of the particular reviewer. I insist on the value of film analysis in the examination of audience response for several reasons. First, most films, much of the time, are constructed so as to generate intended or preferred responses. Films are designed such that audiences, for example, will feel suspense during the battle between good and evil, pity as the protagonist grieves the loss of a loved one, anticipation as she approaches the hoped-for romantic rendezvous, or mixed feelings of admiration and sadness when lovers must part for the greater good of the social group. The process of filmmaking is, in part, the estimation of the way various narrative turns and film techniques will influence the spectators' understanding and experience of the film text. Moreover, the very notions of negotiated (uneasy or conflicted) and oppositional responses to films presuppose the possibility of preferred or intended congruent responses. If negotiated and oppositional responses are possible, then so are preferred and congruent responses. If one accepts the notion of a congruent or intended response as a possibility, then one might discuss the prevalence of congruent responses in relation to the negotiated and oppositional. Staiger argues that spectators all are more or less "perverse" in that they "use" films for their own purposes. But such perverse responses are less frequent than many reception theorists would like to think. It strikes me that the spectator's own purposes are often aligned with the intended functions of the text, and thus cannot legitimately be called "perverse." I would suggest that congruent, preferred, and/or partly negotiated responses are by far the most common types of responses. In the media-saturated environments of the West, at least, there exist a variety of choices about which film to view, and audiences often choose films on the basis of genre, stars, critical reviews, or, as I argue, on the basis of the kind of affective experience they believe such films will afford. Movies are less like blank slates than they are like an immersion into a virtual environment in which responses are largely manipulated by strong sensual cues. Resistance is hardly futile, but resistance isn't what draws audiences to the experience in the first place, and resistance takes a lot of effort. Although we need not accept the determinism of 1970s screen theory, neither is the spectator's experience of motion pictures undertaken under conditions of absolute psychic freedom. The motion picture industry is an institution that strongly encourages certain viewing practices and assumptions about how films are to be understood and responded to. Moreover, it is essential to realize that the oppositional spectator—that is, the audience member who self-consciously rejects the ideology of a film during its viewing—may nonetheless enjoy many of the intended responses generated by the film. Jacqueline Bobo has rightly noted that congruent or "dominant" responses to some elements of a film are sometimes coextensive with oppositional responses to other of its elements. It is not a case of either/or. Thus, she argues, African-American women can simultaneously recognize the racial problematics of The Color Purple (1985)—what some take to be its reinforcement of racist stereotypes—and nonetheless enjoy many of the affective pleasures the film offers. Audiences choose films for the experiences they offer, and they most often relish that experience, or at least wish that they could and blame the filmmakers for not having produced a product that offers them what they want. After having chosen a film, what sort of response might this spectator expect at the actual screening? Although other viewing practices certainly exist, the most common sort of theatrical experience—in the United States, at least—encourages the audience to give rapt attention to the screen. It is not necessary to rehearse the extensive means by which filmmakers and exhibitors endeavor to engage and maintain such attention, such as through the darkened theater, the gustatory comforts of food and beverages, the large screen, warnings not to talk during screenings, narratives constructed to maintain anticipation and curiosity, continuity editing, fascinating images, engaging stars, and so on. The theatrical experience, unlike the experience of viewing a film alone at home, is a group experience, subject to the psychological condition of emotional contagion that strongly pulls for common response (as I discuss more fully in Chapter 4). My point is not that audiences will agree about the quality of the film or interpret a film in the same way. My claim is that congruent or primarily congruent responses—that is, affective responses aligned with the intended effects of the film—are very common for many films. Thus, when one considers the totality of factors that must enter into considerations of film effects on spectators, the film text itself stands as one of the essential elements of the equation. This is true in part because the viewing context is designed to focus spectator attention to the text, to momentarily erase the audience's extra-filmic concerns, and to encourage a shared response to the film being projected. In addition, it must be added that as objects of study, film texts are inherently more interesting than film reviews or fan magazines (or at least so it seems to this "perverse" spectator). Reviews and fan magazines are essential sources of film scholarship that can help shed light on films and spectatorship; it would be folly to deny this. Yet one can easily imagine being fascinated by a film independent of having read film reviews; it is less likely that we would be fascinated by film reviews without having first seen the film. This has little weight in deciding whether the film text has significant influence on spectators, except to say that to make textual analysis peripheral in film and media studies would not only be somewhat bizarre on the face of it, but would also sap the discipline of much of its particular interest. My argument, in brief, is this. Audience response is ultimately determined by a complex formula consisting at least of "conditioners" (context, audience characteristics) and "elicitors" (textual stimuli). Ideally, film and media critics and scholars generate their estimations of audience response in relation to as many factors as possible. Yet it may be the best strategy at times to focus on one of these in isolation from the others. Or it may be the only strategy available when evidence of actual audience response is lacking. Thus, I find context-centered, audience-centered, and text-centered studies all to be of value, assuming that they maintain a certain humility of outlook. In this book, I concentrate on the specifically textual, filmic elements designed to elicit spectator response, but I occasionally make reference to the historical audience and context as well. One last note on terminology is in order. For decades, it has been the practice of film scholars to distinguish between a mysterious entity called "the spectator" and the empirical, flesh-and-blood viewer. The spectator is conceived of as a hypothetical entity, a "position," "role," or "space" constructed by the text. Such talk of the spectator as a role or a position remains even in work that questions psychoanalytic theories, revealing vestiges of subject-as-position theory that still run in strong currents through film studies. But more importantly, such a technical use of the term encourages confusion for both the theorists and the reader, and it is worth demonstrating this to justify the changes in terminology that I propose in this book. Robert Stam, Robert Burgoyne, and Sandy Flitterman-Lewis, in their book about terminology in film semiotics, write that in psychoanalytic theory, the spectator or "the viewer" is "an artificial construct produced by the cinematic apparatus" and a "space" that the cinema "constructs." So far, this is unproblematic. Their next move, however, is to assign human characteristics to this constructed "space" or "position." In describing the psychoanalytic conception of this spectator, they write that in viewing a film, a "state of regression is produced" and "a situation of belief is constructed." One wants to ask how a role or a position can regress or have beliefs. This ambivalent understanding of the spectator is symptomatic of the terminological confusion of screen theory, which at times argues that the spectator is not a flesh-and-blood person, but then describes the spectator in ways that apply to human beings and not to abstract entities. Theorists may claim that the spectator is a concept or a structural term, a construction of the text, but then write that the classical stylistic system leads to a change in text-spectator relationships, as though the spectator were an actual person separate from the text. In his introduction to film theory, Robert Stam implicitly recognizes this problem when he awkwardly distinguishes between the "spectator" and the "actual spectator." Were we to take up this terminology, we might then refer to the position or role established by a film as the spectator, and to the people sitting in the theater as "actual spectators." But why refer to a role or position as a spectator at all, given the confusions the terminology has generated? To avoid such ambiguities, I use the word "spectator" independent of the confusing technical meaning it has accrued in screen theory. I use the terms "spectator," "viewer," and "audience" interchangeably to refer to actual or hypothetical persons, depending on context. Films do offer viewers a role or position (or multiple positions), which the viewers accept or reject, in whole or in part. I refer to such entities, unsurprisingly, as roles or positions. Everyone knows the thrill of being transported by a film, but what is it that makes movie watching such a compelling emotional experience? 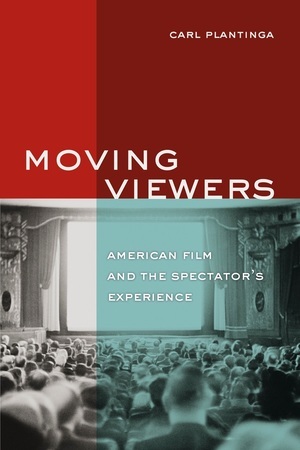 In Moving Viewers, Carl Plantinga explores this question and the implications of its answer for aesthetics, the psychology of spectatorship, and the place of movies in culture. Through an in-depth discussion of mainstream Hollywood films, Plantinga investigates what he terms "the paradox of negative emotion" and the function of mainstream narratives as ritualistic fantasies. He describes the sensual nature of the movies and shows how film emotions are often elicited for rhetorical purposes. He uses cognitive science and philosophical aesthetics to demonstrate why cinema may deliver a similar emotional charge for diverse audiences. Carl Plantinga is Professor of Film Studies at Calvin College. He is the author of Rhetoric and Representation in Non-Fiction Film and the coeditor of Passionate Views: Film, Cognition, and Emotion.